The Free Press Summer Fest presented itself in Houston this weekend. Set at Eleanor Tinsley Park, with a view of the city's downtown skyline behind its stages, the two-day festival was as much as one could have hoped for and more. Ride your bike, bring a blanket to sit on, and wear your swim suit!” was the festival motto, befitting of the summery scene alongside Buffalo Bayou. Hardly Lollapalooza, which also took place over the weekend—in Chicago—the far smaller and less promoted Free Press Summer Fest boasted a lineup that was formidable in its own way. Popular bands such as Broken Social Scene, Explosions in the Sky, Of Montreal, and hometown favorites, like The Small Sounds, pleased festival goers despite typical heat, humidity and even rainfall. Houstonians persevered though, not without a little help from Vitamin Water and Anheuser-Busch and craft beer products provided by Silver Eagle Distributors. The dunking booth and snow cone stand were cool features too. As festivals go, the Free Press Summer Fest went well–especially since this was its first year on the calendar–and brought out many of the positive qualities and colorful people that the Space City has to offer. Houston does not regularly find itself on the summer music festival destination route–or any summer destination route, for that matter. Thought of in the concert world as a stop-over between New Orleans and Austin, the city attracts top-of-the-chart musicians now and again, but not with frequency. There is hope for change. When a conversation in Texas turns to live music, Houston is often overshadowed by Austin, host of the gold-standard SXSW Music and Media Conference and C3 Presents-run ACL Music Festival. Anyone who has attended either annual event knows how well-coordinated and enticing to sponsors those are. To understand the significance of the Free Press Summer Fest being in Houston, one must recognize that this country's festival culture has grown steadily in recent years. Click any festival name below to grasp what this phenomenon has become. Fun for people of most ages, music festivals are on the rise in an industry that has otherwise been flattened in the digital age. No longer Woodstock; these events are money-making ventures put on by can-do entrepreneurs. Logistically challenging, however, they are not easy to organize and pull off. 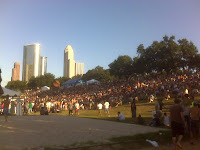 Props go to Omar Afra for bringing the Free Press Summer Fest to Houston, a city that was hungry for it. Afra is publisher of the Free Press Houston, originator of the Westheimer Block Party and part-owner of Mango’s Café. Here’s to another serving of hot music in 2010 – please, just not in August!